The league champions were in danger of dropping 11 points behind Arsenal before late goals at Old Trafford. Daid Moyes: Looking more and more like Michael Caine with each passing day. DAVID MOYES BELIEVES he has seen a glimpse of the old Manchester United after a dramatic late comeback secured a 3-2 win against Stoke. United boss Moyes was in danger of suffering another dispiriting defeat in an already troubled start to his reign when Stoke took a shock 2-1 lead at half-time at Old Trafford on Saturday. But United claimed a 78th minute equaliser from Wayne Rooney before substitute Javier Hernandez, whom Stoke manager Mark Hughes claimed should have been sent off before his heroics, won the match two minutes later in a manner that recalled so many famous victories under Moyes’ predecessor Alex Ferguson. “I thought in the end we had to go for it,” said Moyes, who made three attacking substitutions in a bid to win the contest… We did a lot of good things but an awful lot of real poor things that put us in the situation we were in. After a sub-par start to the campaign had seen United go into the game 11 points behind Premier League leaders Arsenal, defeat would have been unthinkable for the defending champions, especially coming on the back of a home defeat at the hands of West Brom and poor home draw with Southampton. Stoke stunned United when Peter Crouch handed them an early lead which was cancelled out just before the interval by Robin van Persie. A free-kick from Marko Arnautovic, with practically the last kick of the first half, restored a Stoke advantage that lasted until the closing stages. Even allowing for the defeat, the manner of the performance and the difficulty Moyes’ men had in winning the game, left former United star Hughes believing Old Trafford is not the impenetrable fortress it once was. “I think we were encouraged by what other teams have done here – West Brom, Southampton,” he said. However, the Stoke manager does believe that one facet of life at Old Trafford remains constant — the pressure that is applied to match officials by the packed stadium. “It was a poor challenge on Robert Huth, reckless in my view,” he said. “Why the assistant referee didn’t see fit to do something about it, I don’t know. It was a reckless challenge. I think the lad himself will agree with that. You can’t use your leg like that, its dangerous. Email “Moyes eyes low-key title challenge after late rally stuns Stoke”. 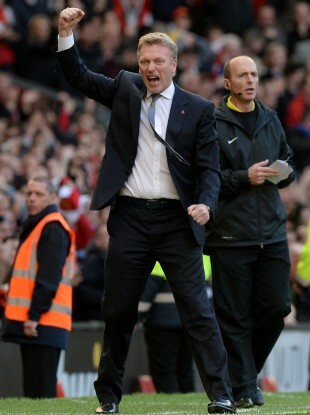 Feedback on “Moyes eyes low-key title challenge after late rally stuns Stoke”.